Ginghamsburg Church in Tipp City, Ohio, featuring Bose® RoomMatch® loudspeakers, powered by Bose PowerMatch® amplifiers, as a centerpiece of its newly installed AV system. Photo courtesy of Ginghamsburg Church. © 2015. 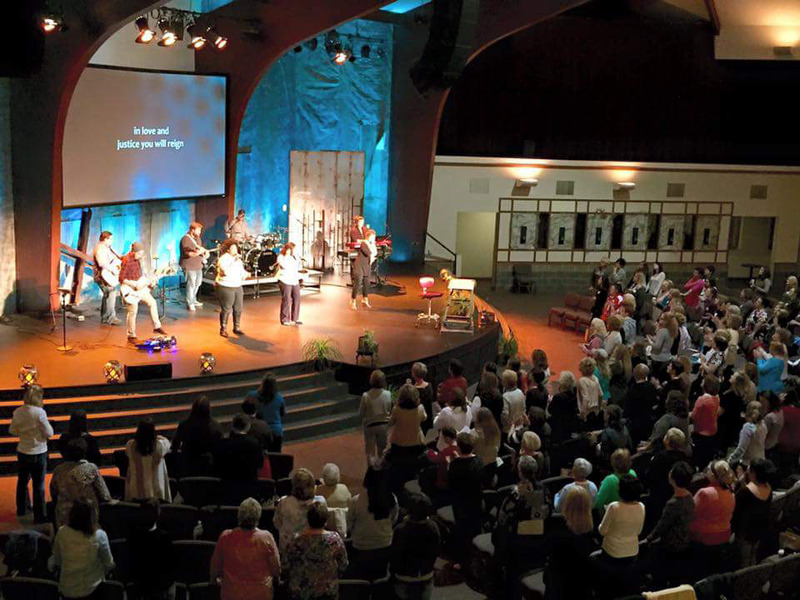 Framingham, MA, November 17, 2015 – Recently, United Methodist congregation Ginghamsburg Church in Tipp City, Ohio, decided to do a major overhaul of its AV system, and church leadership turned to Columbus-based firm LIVE! Technologies for the full package – consulting, vending, installation and service. In performing between 150 and 200 installations a year, LIVE! Technologies has developed a strong relationship with Bose® Professional. For the Ginghamsburg Church installation, LIVE! spec’ed Bose RoomMatch® loudspeakers, powered by Bose PowerMatch® amplifiers, as a centerpiece of the new system. The main concern, according to Chris Benge, the church’s Technical & Sound Engineer, was finding even coverage for the whole space, with enhanced and consistent intelligibility. The space is relatively asymmetrical, so coverage needed a high level of directivity, which is exactly what the RoomMatch system offers. The RoomMatch product line ensures that audio distribution within the sanctuary is now the same for everyone, from the front row to the back of the balcony. 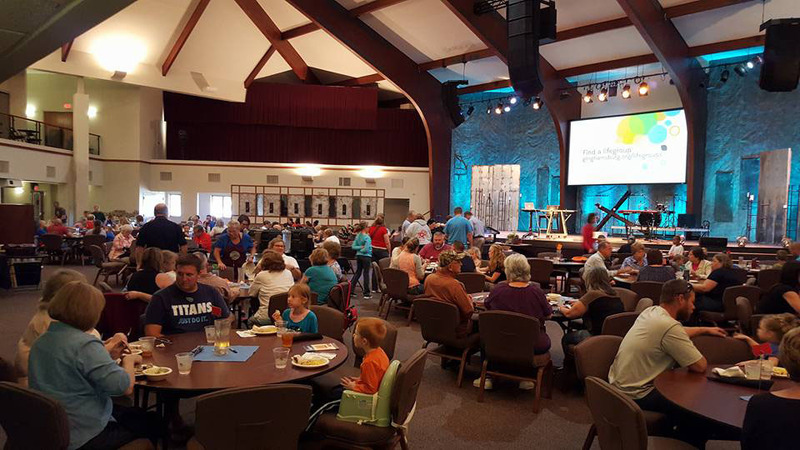 The flexibility of the RoomMatch loudspeaker configurations, coupled with its ability to work well in both spoken word and live music applications, made it the right choice for Ginghamsburg Church. Bose personnel worked closely with LIVE! to demo and configure the system, specifically focusing on tuning the low end, as the church’s worship style involves contemporary styles of music and dance, and “getting the low frequency aligned can make a difference between a thud or click from a bass drum and a more musical percussive sound,” notes Dave Mead, LIVE! Technologies Founder and Strategic Sales executive. LIVE! designed and installed a system that included 12 RoomMatch loudspeakers as the mains, four RoomMatch RMS215 subwoofers (flown) and three RoomMatch RMS218 subs (below the stage), two RoomMatch Utility RMU208 loudspeakers as front fills, ten PowerMatch amplifiers with Dante™ cards and Bose ControlSpace® ESP-00 DSP with Dante card. Photo Caption 1: Ginghamsburg Church in Tipp City, Ohio, featuring Bose® RoomMatch® loudspeakers, powered by Bose PowerMatch® amplifiers, as a centerpiece of its newly installed AV system. Photo courtesy of Ginghamsburg Church. © 2015. Photo Caption 2: Ginghamsburg Church in Tipp City, Ohio, featuring Bose® RoomMatch® loudspeakers, powered by Bose PowerMatch® amplifiers, as a centerpiece of its newly installed AV system. Photo courtesy of Ginghamsburg Church. © 2015. Audinate® is a registered trademark of Audinate PTY LTD. Dante™ is a trademark of Audinate PTY LTD.
LIVE! Technologies provides expert integration of audio, light and video systems. Our team has unique experience and skills necessary to enhance spiritual celebrations, rituals, and services through custom analysis, design, and installation solutions.